In order to limit negative impacts from changing weather and climate conditions and to harness any opportunities such changes might provide, it is necessary to factor weather and climate information into planning and decision-making processes. However, this is not easy to do, especially when it involves multiple stakeholders with different interests and knowledge. As such, there is a need to develop and test new approaches and to share lessons between organizations about what works well and what can be done differently. To facilitate such sharing of lessons, a learning event was organized at the UN complex in Gigiri, Nairobi, on the 1st and 2nd of February 2016. The event was co-hosted by the Global Framework for Climate Services (GFCS) Adaptation Programme in Africa, the Kenya Meteorological Department (KMD) and the Met Office. The objective of the event was to identify good practices and share learning on how to include climate and weather information in participatory planning, assessment and decision support tools and methods between practitioners in the field, with a focus on East and Southern Africa. There were a total of 46 participants from 26 organizations, representing NGOs, research institutes, government departments and international agencies. The event included presentations on various approaches and methods used, and interactive sessions to enable group discussion. Establish a community of practice for continued sharing of innovation and learning. This will be done primarily through the creation of a Mailing List, facilitated by the GFCS office, where project outputs and information on relevant events will be shared. 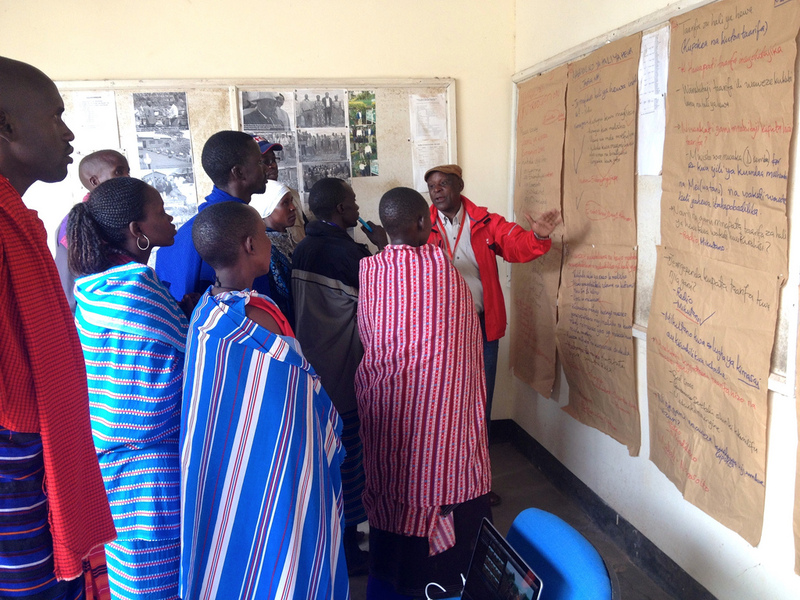 In addition, it was agreed to hold a series of webinars to continue the discussions around three main themes that were identified as a priority: local/indigenous knowledge; monitoring and evaluation; and sustainability/scaling up. Create a knowledge space collecting all available, relevant material. This will be undertaken by the GFCS office through revising the documents section of the GFCS website and including a search function. Documents will be tagged with agreed categories/themes (for instance agriculture/Malawi/communication) and the site will be linked to other relevant web pages. The GFCS office will also use the information provided by organizations to update the GFCS “contributing” projects map. Work towards developing a guidebook/sourcebook for climate service interventions, which will be a synthesis of existing practices, distilling a set of common principles in the delivery of climate services. However, it was recognized that a lot more planning is required for this activity and such an effort will require investment in time and resources from a number of organizations. Continue joint efforts to strengthen coordination at the national level across countries in the region. At the national level there needs to be multi-agency platforms coordinated by the National Meteorological and Hydrological Services (NMHS) to achieve greater convergence. So, where possible, climate service interventions that are planned and undertaken should include investment in the establishment and/or support of such platforms. Sustainability of services and demonstrating impact was a theme that recurred in many of the presentations and discussions, including the need to demonstrate the benefits of providing climate services to influence policymakers at the national level. The discussions highlighted that there are a number of good projects going on but that many of the successes are taking place at the pilot scale. The challenge is how to achieve success at scale and how to integrate large-scale change with the local level interventions. A common theme that emerged was the need to use a multitude of communication channels to ensure the information gets across to potential users and there is a need for co-producing climate services to collectively assess how good the information is. An example of an SMS-based service, presented at the event, was the Mobile Weather Alert in Uganda. This service started as a WMO supported project but is still running as a survey conducted found that 80% of the users found the service relevant. However, in order to scale up this service, a sustainable business model needs to be identified. A key challenge identified is that climate service interventions are trying to get people to take decisions on the basis of information that is uncertain and competing with known existing concerns. Increasing the uptake of climate information also generates a demand for climate information services at different times and spatial scales, which the National Meteorological and Hydrological Services (NMHS) needs to be ready to respond to. The Kenya Meteorological Department (KMD) shared some of the challenges they are facing with the use and uptake of climate and weather services provided, and the results from a number of surveys undertaken to identify why the uptake is not increasing. These surveys have found that forecasts are too general, the credibility of KMD is very low and that information provided through radio and TV is not accessible to many people. KMD has tried to address these challenges through a number of activities undertaken with the Adaptation Consortium (www.adaconsortium.org), such as training County Directors of Meteorology on how to deliver service and engage stakeholders, including basic communication skills, and improving the climate monitoring network, including by training community climate monitors. County Climate Information Services Plans have been developed in 5 counties through Participatory Strategic Planning workshops in partnership with CARE, where the stakeholders come together to understand the seasonal forecast and develop the advisories together to inform plans and decisions. KMD is also considering employing social scientists to help with the co-production of climate services together with users. To join the Climate Services and Participatory Methods Mailing list please contact Sofie Sandstrom, at ssandstrom@wmo.int. On this mailing list you will receive information on upcoming events and webinars, and access to a shared document repository.